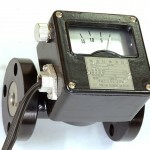 This product monitors the flow rate of oil and detects that the flow rate is less (or more) than the specified value. The flow rate detecting section is designed as a special piston that can control the passing flow rate change to an appropriate level. Accordingly, the scale divisions are arranged at equal intervals to facilitate the reading. If you specify the direction of flow in advance, we can manufacture Oil flow meter either for vertical or horizontal piping.